Despite tough economic times, rates of donations are on the rise. 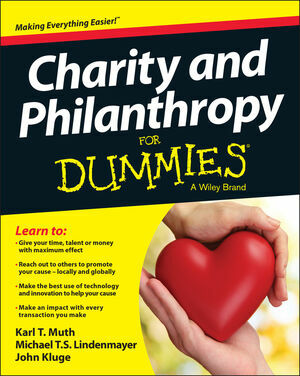 If you want to make a difference but don't know where to start, you need Charity & Philanthropy For Dummies. This is your one-stop, no-nonsense guide to charitable activities. Inside you'll find lots of strategies for philanthropic work such as volunteering your time, raising funds, donating your own cash or expertise, impact investing, and social entrepreneurship. You'll also find lots of case studies from charities big and small to show you what works and what doesn't. You don't need deep pockets to make a difference—you need Charity & Philanthropy For Dummies.